animal acts of love | The Familiar Spirit! 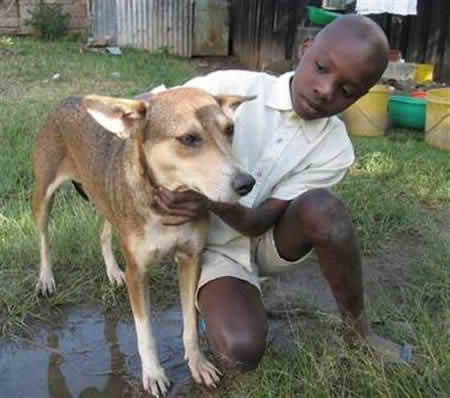 In Nairobi, Kenya, a stray dog saved the life of a newborn baby girl abandoned by her 13yr old mother immediately after giving birth. The heroic stray upon finding the abandoned infant in a forest took action. Being a mother herself the homeless hero somehow carried or dragged the infant across a busy road and through a barbed wire fence to a secluded spot where she lived with her litter of puppies. A nearby resident who was walking near by heard a baby crying and went to investigate. The concerned citizen crouched down and saw to his disbelief the small space with our heroic stray, her litter of puppies and a newborn infant. A dog with nothing and noone fending for herself in a harsh environment, dutifully raises her litter of puppies. With all that hardship and without help she cares for her litter, yet still has the strength and compassion to adopt the baby of another species, bringing the baby into her den with her puppies and caring for her like it was her own. Now that is my choice for the mother of the year. Beautiful what an amazing girl. A stray dog risks his life to rescue an injured friend on a busy Chilean Highway. 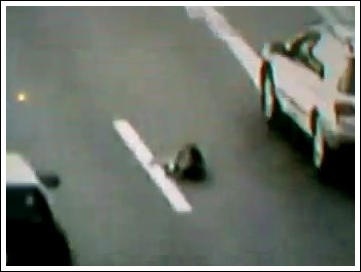 A tragedy played out in the streets of Chile when a homeless dog roamed onto a busy highway and was struck by a car. He lay badly injured in the 3rd lane with heavy, fast moving traffic. When the worlds bravest dog runs up the shoulder of the freeway trying desperately to get to his injured friend. The homeless hero starts towards his injured companion then leaps back toward the shoulder narrowly avoiding being struck by the fast moving vehicle. Starting again towards his injured friend, risking his own life to save the life of a friend. The canine hero at one point appears to be run over by a truck then miraculously emerges unscathed. Driven by the love of a friend and super human courage the second dog makes it to his badly injured companion who lies “alive but motionless” in a center lane. He then raps his front paws around the injured dog’s body and begins dragging him across two lanes towards the safety of the shoulder. With every ounce of strength that he had, the homeless hero dragged the injured dog little by little across the road. All the while cars fly by narrowly missing the pair. Somehow our couragious canine gets his injured friend to the safety of the shoulder. A road crew witnesses the whole event and comes to help. Unfortunately our hero runs off when the road crew arrives. The injured dog was taken by road crews to a veterinarian and later died. Many calls came in with offers to adopt the homeless dog. A search was conducted for what the chilean people dubbed there hero dog. Months later officials called off the search claiming to much time had passed. The dogs were strays and probably one another’s only friends in the world. A homeless dog in an act of pure love and unflinching courage demonstrates his willingness to lay down his life for a friend. "Bella" Dies a Hero in Her Owners Arms. Nicole Russell, who lived in Johannesburg, South Africa, was about to leave for work one morning when a car pulled up and four armed men jumped out and demanded her keys and purse. Nicole held both arms out so that they could take her jewelry and keys. Scared and confused she rushed to comply with their demands not realizing that she had mistakenly handed them her house keys. The men became agitated and violent when the keys would not unlock the car. When one of the men grabbed her and began dragging her towards the car Ms. Russell (in fear for her life) screamed. Russell’s mother, alerted by the screams pushed a panic button in the house and ran into the garden. There she was confronted by an attacker with a knife. Bella, the family’s 4 year-old Staffordshire Bull Terrier, was with the mother and immediately lunged at the knife wielding attacker. Bella bit the man several times on the leg and was then shot in the head by one of the mans accomplices. In spite of her injury Bella continued to defend her family until the men panicked and fled. There was a point when one of the men (having just shot at Bella) turned his gun on Nichole and pulled the trigger. But either the gun misfired or Bella had taken the bullet intended for Russell. When the men were gone Bella sat down and rolled over and as Nicole held the hero dog Bella in her arms. Bella looked at her quietly for a few moments and died. An autopsy showed that Bella’s heart had been completely drained of blood in her fierce battle to protect her family. On November 8, 1997 “Bella” was awarded posthumously a seven ring rosette trophy for her selfless heroism defending her family. A collection of videos about animals, animal rescue, animal activism, animal tributes etc. angel animal acts of love, devotion, courage, compassion, intelligence, communication, grief and emotion. Videos of Animal Activism and about Animal Rights. Links to Full length movies about animals. Buddy is a touching story with a tragic ending. Bill Hitchcock was the sole caretaker of a remote lodge on Knight Island, Alaska. While out cutting firewood, Hitchcock was struck by a piece of timber and died. For the next two weeks, his faithful four-year-old black lab, Buddy, paced between his owner’s body and the shoreline looking for help. He managed to survive the brutal February temperatures that reached -23°F before leading searchers to his owner. After people heard of Buddy’s story, over a thousand letters, calls, and emails were sent by people hoping to adopt him. Finally, Bill’s neighbors, Roger and Marilyn Stowell, decided that Jim Brewer, the mayor of the Alaska Peninsula village of Chignik would get him. Tang, a Newfoundland dog, saved 92 people from a sinking ship in a horrible storm. During a snowstorm in December 1919, a ship called the Ethie crashed into rocks off the shore of Newfoundland, Canada. Ninety-three people were trapped on the ship as the ocean pounded it into the rocks. The crew tried to throw one of the ship’s ropes to people on the beach, but they missed. Then one of the sailors took the rope and jumped into the ocean. He tried to swim to the beach with the rope, but he was carried out to sea and never seen again. Then the ship’s captain saw Tang, a Newfoundland who lived aboard the Ethie. The captain knew Tang was their last hope. He gave the rope to Tang. With the rope in his teeth, the dog jumped into the sea and swam for land. In the huge waves and strong winds, it must have been hard for Tang to swim—the undertow tried to drag him out to sea and the water rushed into his eyes and ears. But he swam on until he reached the shore. People on the beach ran into the water to pull Tang onto dry land. They took the rope from his mouth and tied it to something strong. The rope was used to bring the people on the sinking ship to land. All 92 people on the Ethie were saved. History books don’t say what Tang did once he’d made it to land, but it isn’t hard to imagine the excited dog looking for his human companion, greeting every person that came from the ship. Lloyd’s of London, the famous insurance company, gave Tang a medal for bravery, which he wore for the rest of his life. Adapted from Dog Heroes, by Tim Jones. Seattle: Epicenter Press, 1995. A remarkable tale that should stand as a lesson to us all about the true nature of love and friendship. 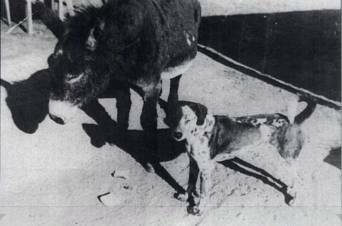 Shorty was a burro and the beloved town mooch who had lived in Fairplay, Colorado in the early to mid 1950’s. Shorty never had it easy, though he did have the freedom in his later years that he had never known in his prime. He began life in Fairplay as a miners mule. These mules that were forced to slave in the mines in those days rarely saw the light of day. The life of a mule in the mining industry was one of backbreaking labor, merciless hours and cramped, dark living conditions. Luckily for him, the mule became obsolete in the coal mines and he was no longer needed. Shorty’s stubby legs and low slung back combined with the years of backbreaking labor affected his health and so rather than being cared for by those he had worked so hard for, he was discarded. Shorty was now homeless and left to fend for himself. During hard winters Shorty suffered terribly. With his grazing ground covered in snow he had to go hungry for long periods of time. To make his situation worse the old burro started to go blind. Enter the homeless mutt that a local family affectionately named Bum. No one knows where Bum came from he just showed up one day on the streets of Fairplay. Bum and Shorty became fast friends and Bum would often lead his blind friend down the city streets to the edge of town where the good grazing was found and would patiently wait while Shorty grazed grass. Where ever Shorty went his best friend Bum was always with him. During the winter the pair had to resort to living off hand outs. Bum quickly learned which places and people were friendly and kind hearted and which were not. Bum would lead Shorty to a door and Shorty would bray to let the folks inside know he was there. Bum would take what food he was given and lay it down in front of Shorty, only after Shorty had eaten his share would Bum himself eat. The pair made a lasting impression on the people of Fairplay. Sadly… in the year 1951 Shorty was struck by a car and passed away . 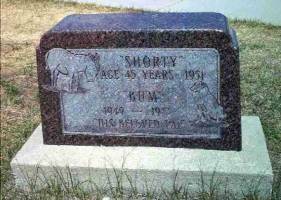 A testament to Shorty’s popularity in Fairplay, he was buried on the courthouse lawn. His best friend Bum was so grief-stricken that he laid down on Shorty’s grave refusing to eat or drink. The devoted dog Bum died soon after his beloved friend. Shorty’s grave was dug for a second time so that Bum could be laid to rest (and rightfully so) with his best friend Shorty. So devoted to his friend was Bum that he followed Shorty even into the after life.